Memorial Day is a holiday, not an ordinary weekday. One of many pleasant ways to spend a holiday is to watch live sports. Let’s put it this way: If it’s good enough for a Sunday, it should be good enough for a holiday as well. That basic distinction brings up the first genuine problem with American television coverage of the 2015 French Open, televised by three outlets — Tennis Channel, NBC, and ESPN2 — instead of only one. The mixed-bag nature of French Open coverage, a reality owing to the three-way TV split, exasperates and confuses American tennis viewers at every turn. There is precious little day-to-day consistency in the nature of coverage, and this — as much as anything else — lies at the heart of Monday’s broadcasting controversy. On Sunday, NBC came on the air with live tennis in all time zones at the start of its time window, at 1 p.m. Eastern and 10 a.m. Pacific. It’s true that NBC’s decision to air tape-delayed or live coverage is a constant point of uncertainty on weekends, but that’s a separate discussion. This is not about whether NBC fills its broadcast windows with taped or live tennis (that will be covered later in the French Open). This is about the larger issue of whether NBC comes on the air with a national feed in all time zones and equally serves viewers in all areas of the United States. In other words, does NBC — if live at 1 p.m. Eastern — also come on the air at noon Central, 11 a.m. Mountain, and 10 Pacific, whether it shows live tennis or taped action? NBC did this on Sunday. It did not on Memorial Day. The essence of NBC’s decision, then: Let’s prioritize our weekday talk shows over tennis in the non-Eastern time zones. NBC came on the air at 1 Eastern on Memorial Day with coverage of the highly-anticipated first-round women’s match between two highly recognizable American players, Venus Williams and Sloane Stephens. Naturally, a match this big for an American audience should be available for viewers in all time zones, certainly on a holiday. However, viewers in the Central, Mountain and Pacific time zones all reported that NBC was not on the air at 1 Eastern. Tennis Channel, with a large broadcast window on Monday, stuck with Andy Murray’s first-round match so that NBC could take over Venus-Sloane coverage (a proper decision, by the way — there’s no point in having same-match coverage by two networks). This is not Tennis Channel’s fault. This is a matter of NBC freely choosing to not make holiday coverage equally accessible to all Americans. In the Pacific time zone, for instance, NBC’s three-hour Memorial Day window did not begin until noon. This is not a first-time occurrence — it’s happened before in the past — but the specific point of confusion is that if NBC went live in all time zones on Sunday, why would it not do the same thing on Memorial Day? In past years, when CBS broadcast the U.S. Open men’s final on a Monday, some CBS affiliates would air talk shows instead of the live match. The reality of seeing TV stations (albeit at the local level, not a national level) value taped programs over live tennis is therefore not a new thing. The key insight, though, is that ESPN or ESPN2 would not face this conflict. They would air live tennis and not have to worry about a daytime talk show. Now that ESPN has full control of the U.S. Open, with CBS out of the picture, viewers never again have to worry about the possibility that they’ll miss live tennis at that particular major tournament. However, at the French Open, NBC — even on a holiday — is still invested enough in talk shows that it did not want to show Venus-versus-Sloane live to all of its American audience. Sunday? Live tennis for everyone. Memorial Day? Only in the East. 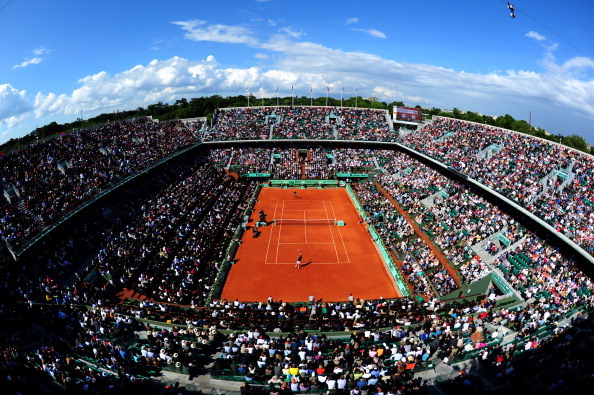 The unpredictable, unreliable, hard-to-access nature of French Open television coverage in the United States remains very much intact in 2015. Some realities are meant to remain intact; this is certainly not one of them. When NBC creates a media story in relationship to the French Open, the news will almost always be negative for American tennis fans.